I thought I would tell you a bit about my experiences of upgrading my Dell Inspiron Laptop. I Have been using this for many years and have been very happy with it. It runs Windows Vista, which a lot of people don't like, but it has worked well for me, and, frankly, a well patched copy of Vista seems very little different to Windows 7. 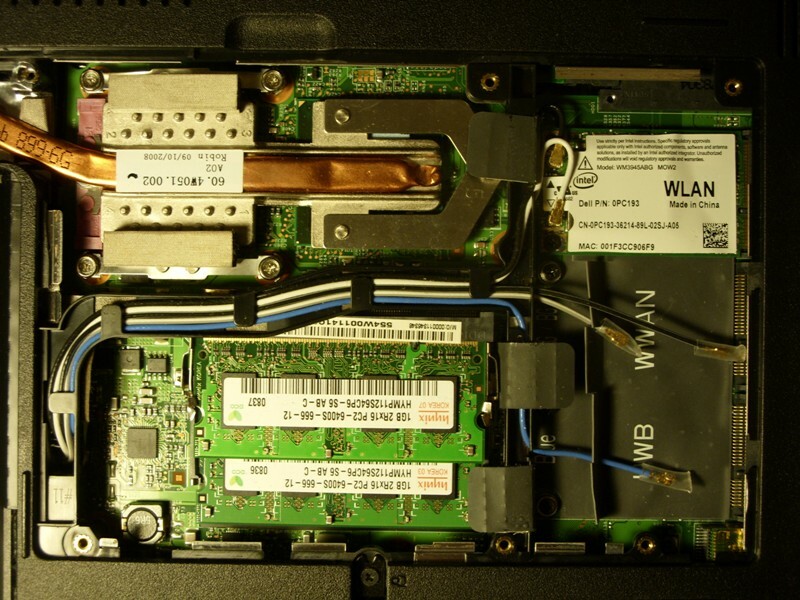 A popular upgrade for any laptop is to fit a solid state hard disk. A lot of the slowness of any computer seems to be caused by disk access. This computer has a 250Gb hard disk which is getting pretty full, a Samsung Evo 850 250Gb SSD was available for about £60, which seemed very good value. I back up onto a 1Tb external disk, but to have a "spare" disk which is a exact clone of the disk in the computer is a tempting extra benefit of performing this up-grade. The only down-side to using Solid state disks is the limited number of write cycles that can be performed. It numbers in the 100s of thousands, and modern disks have clever software which spreads the data around on the disk, minimising wear to any particular part. 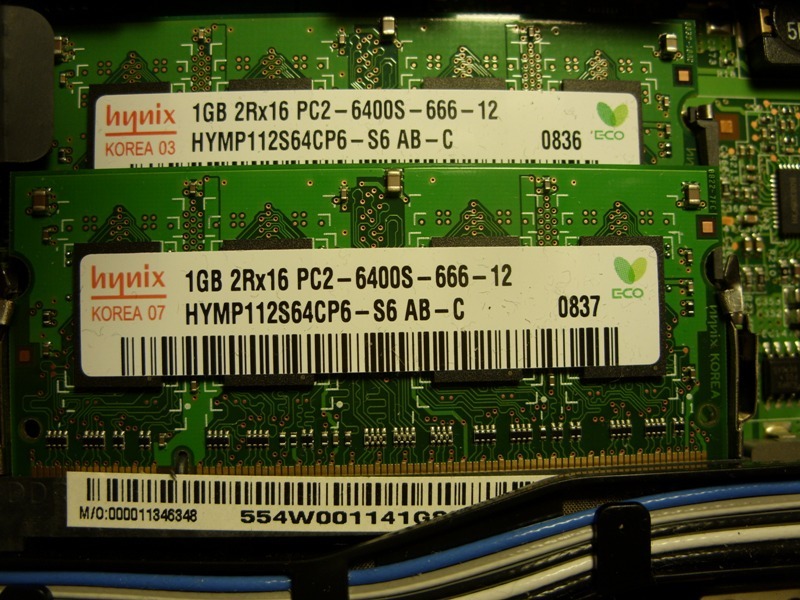 When memory is low, Windows uses "virtual memory" where it uses part of the hard disk as an extension of RAM. A computer which has limited RAM will make many more reads and writes to the hard disk. Obviously this can be reduced by maximising the amount of "real" RAM fitted to the computer. So before fitting the SSD I decided to do that. There are two "slots" in this Laptop and they were both occupied with 1Gb modules. The largest size you can fit to the Inspiron 1525 is 2Gb which gives a total of 4Gb. Access to the memory is very easy, there are eight screws to remove and then you lift off a panel on the underside of the computer. There are a number of Youtube videos about this so I won't go into great detail here. 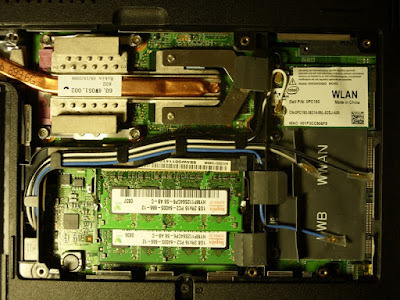 This is the one I found best: Youtube Video shows how to change the RAM in a Dell Inspiron 1525 Laptop. You can see the pair of memory modules in the photo below, together with the heat-pipe leading away from the processor and the WiFi module among other things. I will say a word or two about my choice of replacement RAM modules, or "SODIMMs". When I looked for replacement RAM on the internet, I found there were some websites where you punch in the make and model of your computer and the website recommends the "correct" type of module to buy. I was going to click "Buy Now" on one of these, but then thought I should check what was already fitted. The site had recommended PC2-5300 modules, but if you look at the picture below, you can see that PC2-6400S modules are fitted. So this worried me, and I decided to try and find out a bit more about the numbers on the modules. The Wikipedia article on DDR memory is quite useful in this respect: Wikipedia Article about DDR memory. The 6400 RAM seems to be slightly faster than the 5300, so that was what I decided to fit, even though it was a bit more expensive. 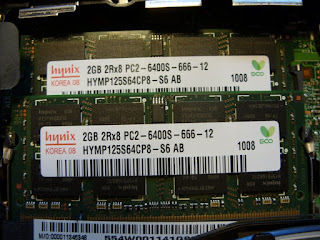 Indeed, I looked for some RAM modules by the same manufacturer, Hynix, because I reasoned that near identical, but larger, modules would give the least opportunity for incompatibility. As an electronic engineer, I have sometimes encountered small differences in spec between two components made by different manufacturers that can cause annoying problems. As you will see below, I have fitted two Hynix DDR2 PC2-6400S modules and they work absolutely fine. Incidentally, the "S" on the end of 6400 seems simply to mean "Small" and refers to the fact that these are laptop modules, and not the slightly larger form of SODIMM used in Desktops. Also the 2Rx8 and 2Rx16 numbers seem to be unimportant, and would appear to refer to the number of ICs on the SODIMM.